Korea’s Yu-Na Kim won the gold medal by scoring a world-record 210.03 points, easily surpassing the 207.71 she scored at the 2009 World Championships. The Japanese du of Mao Asada (173.99) and Yukari Nakano (165.70) claimed the silver and bronze medals. “I was very surprised when I looked at the scoreboard that I achieved a personal best in the first competition of the season,” said Kim. She won four of five international competitions last season, finishing second to Asada by 2.20 points at the 2008 Grand Prix Final. In Paris, Kim opened her free skate with a flawless triple lutz-triple toe combination that three of nine judges awarded the highest grade of execution. She omitted her next element, a planned triple flip, but landed a double axel-double toe-double loop and performed a Level 4 combination spin and a Level 3 spiral sequence. Kim only got stronger from there with five more jumps, two more spins and a step sequence. “This is the Olympic season and the first competition after I became world champion. I was worrying about that, but I finished my program without any problem,” she said. Asada landed a triple axel in combination with a double toe to open her free skate. But with her next triple axel downgraded for under rotation, the 2008 World Champion had no chance of catching Kim, although she surpassed her teammate. Nakano received an edge call on her triple lutz and the downgrade of the Salchow in her triple Salchow-double toe combination. 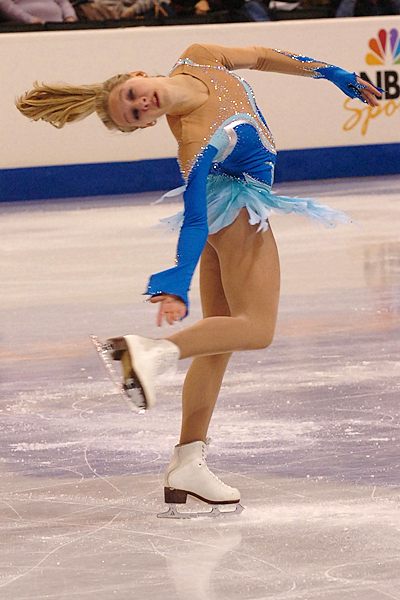 Former World silver medalist Carolina Kostner finished fourth in the free skate, ahead of 2007 World Junior Champion Caroline Zhang of the United States. But Kostner (147.63) could only muster a sixth place finish overall while Zhang (153.15) took fourth. Zhang had trouble with her jumps Saturday, receiving downgrades on the triple Salchow and the triple loop in her triple loop-double toe-double loop and also having her triple lutz called for the wrong take off edge. Her flying sit spin also was given a Level 1 and her step sequence was given a Level 2. Gilles opened her free skate with a shaky double toe-double toe combination that was downgraded to a double-single. Although she regrouped to rattle off a triple lutz, triple loop, a double axel and a triple flip-double toe-double loop, she singled her second triple lutz. She recovered with a triple Salchow-double toe. The free dance closed out the competition on Saturday. By a margin of more than 16-points, Canadians Tessa Virtue and Scott Moir (197.71), the reigning World bronze medalists, won the competition over silver medalists Nathalie Pechalat and Fabian Bourzat of France. Great Britain’s Sinead Kerr and John Kerr were third with 177.11. U.S. silver medalists Emily Samuelson and Evan Bates were fourth overall with 158.07 after finishing fourth, sixth and fifth in the compulsory, original and free dances. U.S. bronze medalists Kim Navarro and Brent Bommentre (150.29) were sixth overall while newcomers Madison Hubbell and Keiffer Hubbell, the national pewter medalists, placed eighth by scoring 143.28.